Del Warren, USA Bowling Gold Coach, said of Revolution's Warren Friedl, "Warren is one of the best fitters in the country." Del Warren is a former Professional Bowler and former President of the International Bowling Pro Shop and Instructors Association (IBPSIA), Vice President of Kegel Training Center, and former President of (ball manufacturer) Track Inc.
Congratulations to Warren Friedl for rolling 203-257-300, 760 series on the Oaklawn Sportsman League at Orland Bowl Monday April 9th, 2018. The game and series was rolled with a Storm HyRoad pearl. "Thanks to Storm, Roto Grip and 900 Global for making such good bowling equipment." Warren Friedl. "The fit of my new ball is fantastic, when it rolls off right WOW!" Loren on his new Columbia 300 White Dot. New bowler Danielle commented: "I was just calling to get a price on a ball and you were nice enough to explain the importance of a good fit." Danielle mentioned further "It sounded like you wanted to help me." And we do Danielle! Danielle bought a new Columbia White Dot. New Instructee Don, a 168 average bowler, rolled two games after his first lesson. 209 and 218. A fit adjustment and some information. Bowling is easier when you know more about what to do and when it is easier to do it! From Jim Hughes March 6th, 2014, of the "Crimson Chin" Team from the Thursday Night Miller Men at Thunder Bowl: "I've been a 180 bowler for years, but you worked with me, helped with my fit and I've rolled 650+ for the last couple weeks. It's amazing. Thank you." "The new Roto Grips you drilled for me are, of course, fantastic! The Haywire is archy, strong and continuous and just PLOWS through the rack and off the pin deck. Gotta love that! The Devour allows me to move right and square up which is my "A" game. The Devour smashes the pins really good! High flush strikes are monstrous! The new red and blue Shout is really long and strong on the back of the burnt up outsides. All three Roto Grip balls have amazing performance!" "So overall another fantastic job on your part giving me three more Roto Grip balls of mass pin destruction! Thanks!" OWN IT! ROTO GRIP ROCKS! "Thank you so very much for that information. People such as yourself, are what keeps our sport growing." Stan. Congratulations to Denise Spiess, as the high average Woman in the recent 2015 Coors Light / BPAA Pins-Over-Average Tournament Chicagoland finals at Sunset Bowl in Waukegan. 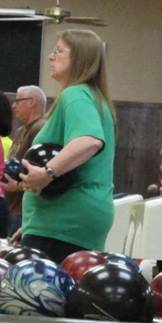 May 2nd, Denise rolled a scratch 690 (235-232-223) placing 2nd in the finals field. Her 690 placed her 9 pins from $10,000 and first place. Second place was an all expense paid trip to Hawaii. Denise rolled the Hammer Black Widow Legend all day. Way to go Denise! Her recent success tops off a nice rise in her average flirting with 200 at the end of the season, using a Hammer Black Widow pearl and the Black Widow Legend. More than 7,600 bowlers entered the 2015 Coors Light/BPA Pins-Over-Average Tournament at the in-center level in February. 2015 Pins-Over-Average press release. A Little Bragging from a 175 Average Bowler (From Dennis Smunt): “A few weeks ago, I finally shot a decent series, 203, 226,221 - 650. You were one of the opponents (Dropsvending.com) at Thunder Bowl, Thursday Night (March 20) Miller Men's league. Your presence was a big factor. The ball that I used was a 15 lb. (Brunswick) Alpha-Max that I hadn't used for over a year. It was re-drilled by you last year and was the perfect ball that night for all three games. I recently decided to buy a Brunswick Melee from you. The ball was drilled perfectly. I used it in practice yesterday, first time, (and) first game, rolled a 219, with one errant shot, an open. A few games later, I invited you to teach me a lesson, which you did, shooting a 279, one ten pin away from a 300, to my 207. Your knowledge and expertise are second to none. Thanks Dennis. Keep practicing and make sure you are open to playing the lanes for optimum carry. Once again, thank you very much for your help Mr. Friedl. I took my (Ebonite) Tornado to my local pro shop and it turns out it was illegally weighted, and the overall position of the pin and center of gravity was forcing it to be static and thus hard to generate revs. I purchased a (Ebonite) Mission X, and saw the improvement right away due to proper drilling. I was able to hook the ball immediately! Warren went the extra mile to answer our questions and clearly is an expert in his field. It would be great if there was a "chat" feature" on this website (AllExperts.com/sports/bowling) to allow more of a dialog with him, as my own lack of knowledge made it difficult for me to fully understand his answers. I wouldn't hesitate to ask for his advice in the future - it is truly valued. Tonight at Orland Bowl I had an 11 strikes in a row 290 game using the mighty Roto Grip Defiant! Just wanted to tell you the glorious news! Now I get a USBC 11-in-a-row award which I understand is a crystal trophy! Cool! So once again you and Revolutions -Mokena get big accolades for yet another monstrous weapon of mass pin destruction - Roto Grip Defiant! Thanks, as always, for all your expertise and assistance. Hey Coach, Surprisingly used (Brunswick) Alpha Max ONLY except for spares on the right. 5 ten pins, 2 five pins, no splits, but four opens - 599 series, which could have been much higher. Your recent coaching has really helped. Your student, Dennis. From the Roto Grip website: 10th Career 300 Game With Disturbed! "That's me on the left and Warren, my expert pro shop professional, on the right. Warren has given three Roto Grip 300 game balls - Theory, Disturbed and Rogue Cell! Many thanks to Warren and also to Chris and Roger at Roto Grip headquarters for their support and for the great-looking Roto Grip jerseys!" Terry VerHaeren Sr Caught a little "too strong" reaction Thursday night at Thunder Bowl rolling Roto Grip Berserk. Watching his struggle, moving a couple boards at a time, I suggested a bigger 6 boards move left, an adjustment in target and he popped a 268. He might pay me to line him up! Nice rolling TV Sr.
"Hey Coach, Bragging again, but I can't help it! Used your cheat sheet from our past lesson, regarding feet position, ball position, pushaway and pendulum swing as a reminder." "Rolled a 200-267-201, for a 668, with three ball changes and your gift spare ball. 0nly two opens, the 3-10 and 6-7 splits, which I missed each by a literally a hair in converting. Only regret was not changing to the (Storm) Natural for game three. But Hell, so far that's my lifetime high series. Even Caesar would be proud. More importantly your hard work and patience with me are beginning to bear fruit. Muchas Gracias, Warren!" Worked with Nikki from The Tuesday Morning Ladies at Thunder Bowl half-an hour ago (Nov. 6 at 7:30pm). She averages 104. After a quick tips lesson, Nikki rolled a 132 and 137(open in the 10th) in the next two games. She's pre-bowling tonight! After receiving a surprise gift (a Roto Grip Rising Star) from a teammate, Mike Jones asked for a surprise layout. He reports: "I started the night with Roto Grip Rising Star. The motion from RS is unbelievable! I really like the layout you surprised me with - the layout makes RS go very straight through the fronts and RS stays on that trajectory. Then, at the end of the pattern, RS squares up very evenly and isn't "jumpy" which I really like. RS faces up smoothly and strongly and this look reminds me of the look I get from Mutant Cell in that the motion of both balls facing up is very similar although I know there is a vast difference between the cores of Rising Star and Mutant Cell. Vastly different yet similar in look - amazing!" Congrats to Richard Reardon on reaching his goal of shooting 700 (again). His first 700 was 30 years ago, and he never got his 700 chevron from ABC. He accomplished his goal Tuesday October 2nd. at Palos Lanes. with a 267 finish, Rich rolled 705. There are plenty of guys rolling 700 these days, but Rich came to me averaging 148, took lessons and invested in equipment to achieve his goal almost 5 years after he joined a league after a 25 year layoff. Next goal 300. In the 700, Rich rolled two games with 9 strikes, so I expect that goal is going to be reached sooner rather than later. I admire the tenacity and commitment. Great bowling big guy! From an online customer Saul who wrote: "If I knew about you 10 years ago when I was able to, I would have been on a plane the next day. In 17 years of poor fits, it's a rarity to have someone even listen to problems with a ball drilling, much less know what to do about it." "...I am hearing so many people saying that they appreciate your help. Yesterday Emit shot a 276 (and 726) and he was telling everyone how much you helped him. He really likes his new ball (Storm Frantic). And Bob on his team was bowling very well with his new ball (Storm Invasion). Another guy on his team asked Emit if he had your card and Emit gave him one. He said he will be talking to you very soon." from Jim Tinerella. Further "Dennis from Monday nights at Orland Bowl was thanking me for telling him about you. He said he wished he knew that there was someone who could help him years ago. He said he was going to keep taking lessons from you." "Thank you again for suggesting that I move both my feet and target left last week at Orland (Bowl). I had a terrible first game yesterday with three splits in the first four frames. Then I started to move left until I shot 268 the third game." From Jim Tinerella. Glad I could help Jim. But YOU still needed to throw the ball, so great job! Good news from Karen Hanson, her new Christmas present is rolling well. First game with a pearl Columbia 300 Ransom was 255, sparking a 666 series at Town and Country in Joliet. The former college bowler is looking forward to using the new “tool” in some tournaments, including USBC Nationals. Tony Webb rolls 735, highest 3 game series of his career, second 700 series, in the Thursday Miller Men’s League at Thunder Bowl Feb. 2nd with his Storm Virtual Gravity Nano. Quick report from Kyle Ciladella, “NO 10 pins!” and a 276 in his first set (661) with his new Storm Victory Road Pearl at Orland Bowl. Nice seeing Angie, she just purchased a Brunswick Caribbean Blue T-Zone, her first finger tip ball. When taking her FREE lesson (with the purchase of any poly ball), she rolled 130-128-178. Angie averages 120, and she missed spares in the 10th of the second AND third games. She could have topped her highest game ever with the spare in the last game. Good bowling. Nice to hear from Chris Frank bowling at Lynwood Bowl and Orland Bowl with his new Storm Frantic and Storm Marvel pearl. First outing, Chris rocked a 266-247-278 for 791. He just loves that Frantic, so he bought another one. Oh YEEEAAAAHH. Mike Jones, a big Roto Grip fan, e-mailed a report on a Roto Grip SD73 that he traded for. "The SD-73 is a going to be a great weapon for the third game after the shot transitions and settles down. ... I really like how the SD-73 glides effortlessly through the heads and then gathers all of its energy for the big pop at the back end. The SD-73 reacted EXACTLY how I had hoped and EXACTLY how you predicted it would so once again my hat (and bowling shoes) are off to you for exhibiting your unmatched knowledge and professionalism. Yet another Roto Grip monster has been created and what makes it really good is now I have a third game ball I can rely on when the shot opens up." Mike - it's fun to drill for a very proficient player, knowing your consistency and skill. Thanks for the compliment. Warren. Ben reported his wife is getting used to her new Storm Victory Road solid. She ripped a 256 last week in league and now everyone wants to be her doubles partner. A grip change and encouragement to relax and free the swing is starting to payoff. Steve got real excited following up on a 254 (7bagger) outing in the Thursday Miller Men at Thunder Bowl. He rolled 15 in a row across two games. The 268 and 240 duo (17 out of 19) helped him roll one of the best series of his career. Great shooting Steve, thank Chris again for getting you the new Columbia 300 Ransom Demand. 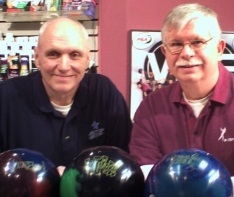 Bill reports a new personal high game of 202 bowled during league pre-bowl at Orland Bowl using a Storm Virtual Energy. Bryce mentioned a new personal best of 187 during league Saturdays at Thunder Bowl with his new Target Zone. After some lessons and a ball that fits, Bryce is planning on trying out for his High School team. Cheryl rolled with a #9 pound house ball in weekend league at Thunder Bowl. She was uncertain what weight to get but after encouragement opted for an 11. The correct fit and weight helped her nearly beat hubby, rolling a 146 her first game with the new Columbia White Dot (she averages quite a bit less). She commented: "I could just hug you, WOW it just rolls off." Proper ball fit allows the ball to just hang in your hand, so additional ball weight can be rolled easily. Mark's dad stopped in to get a fix on a thumb grip that loosened up in his Columbia 300 NoiZe. His average at Oak Forest Bowl last season went from 128 to 171, likes the new fit and his new ball. Still throwing it hard enough, you can barely tell what color it is!! Great news from Tom who bowls on the Friday Men's league at Orland Bowl, he mentioned he snagged the Most Improved Bowler Award. Way to go Tom! Thanks for all your feed back, I will post comments here to share with other customers and on the Revolutions-Mokena Facebook page. Revolutions Bowling Services, Orland Park.